While events in Flanders and on the Rhine may have grabbed the attention of history, the War of the Spanish Succession (WSS) was (at least in theory) all about who succeeded to the Spanish throne, and there was much fighting and dying to be done in Spain itself in an attempt to resolve that question. The majority of the Spanish themselves supported the accession of the Bourbon Duke of Anjou, named Philip V, while the rest, including most Catalans, supported the rival Habsburg Archduke Charles. This was mainly because the Catalans treasured their remaining autonomy from Spain and thought Charles, with his Austrian background, would be more sympathetic to their local aspirations than the French-backed Philip. By 1713 however much had changed and all the major powers signed peace treaties recognising Philip. The Catalans stood alone in defying him, and after the Treaty of Utrecht he began a siege of the Catalan capital, Barcelona, to finally crush resistance to his rule. After an epic operation lasting over a year, the French and Spanish Bourbon forces forced their way into the city, which formally surrendered on September 11th, 1714. GerMan (a company from Barcelona) have not surprisingly chosen this momentous date as the theme for their first figure set for this conflict, depicting some of the regular soldiers that defended the city for so long. Soldiers in the early years of the 18th century wore uniforms similar to civilian fashion, and leaving aside colour and fine details there was little to tell between the troops of almost any European nation. Spanish troops, whether fighting for Charles or Philip, usually had a belly-box for cartridges and relatively large cuffs on the coat, but were otherwise dressed in typical fashion of the time, and that is how these figures have been depicted. All have the sword at the waist and bayonet on the left kidney, and of course the large coat with decorated pockets that partly obscured the breeches and stockings. The fusiliers all have the usual tricorn but two of the figures are of grenadiers and have a typical Spanish grenadier’s hat with falling bag to the rear, although in this case there is no apparent fur trim on the lower edge. The standard-bearer and mounted officer both have the kind of finery we might expect of such gentlemen, while one figure goes to the other extreme as he wears no coat and seems to be fighting in his shirt-sleeves. By the end of the siege many uniforms were in poor repair so such a figure would seem reasonable, even amongst regular troops (and apparently other sets will depict the irregulars and volunteers), so everything here is accurately done, although whether the flag should be a little bigger is hard to ascertain. If it is full marks for the accuracy then the poses are less of a success. Many are perfectly good, with the man in the top row holding a musket while another is over his shoulder being an unusual but reasonable choice. The bare-headed man in the same row is very nicely poised, although the grenadier to his side is not convincing if he is meant to be throwing his grenade. The man kneeling and reloading in the second row is performing a relatively tricky operation, and doing it with the wrong hands. He would normally be holding the musket with the left hand (exactly the same as if he were standing) and handling the cartridge with his right. He would therefore need to have the musket to his left side, so this figure is in fact the mirror image of the correct pose. Things get a whole lot worse however with the figure to his left, which is truly awful. Poses using muskets as clubs have always been difficult to get right, yet even so this is a really poor effort which has no credibility in our view. The last two soldier poses and the two officers however are very good, and even the three (yes there ARE three) figures on the diorama piece are not bad at all. As we have so often said, including just one or two grenadiers does not achieve much by itself, so in our mind the manufacturer should have made a whole set of grenadiers and left this set for the fusiliers only, although the representative nature of this set does help to explain that. Nevertheless the majority of the poses are good and most are usable. These figures are quite pleasing to the eye but are not as elegant or proportionally perfect as those from larger manufacturers. Limbs tend to be a bit thick although this is as much a question of style as some people prefer this look. The sculpting is surprisingly good, with a fair attempt at the lace that decorated pockets etc and some very nice faces, while even the locks on the muskets have been quite well done. It would seem that a flexible mould has been used because there are areas which are clear when a steel mould would not have reached, so in many ways the figures are very nice. This is particularly apparent on the tricorns, which are fully moulded inside the brim and look good. It must be observed however that these figures are made in the same material that previous GerMan figures have suffered from, which is to say a plastic rough to the touch and very vulnerable to breakage, particularly in areas which are commendably thin and realistic such as musket barrels and swords. GerMan point out that they can be glued together again, which is true, yet this fragility will still put many customers off. 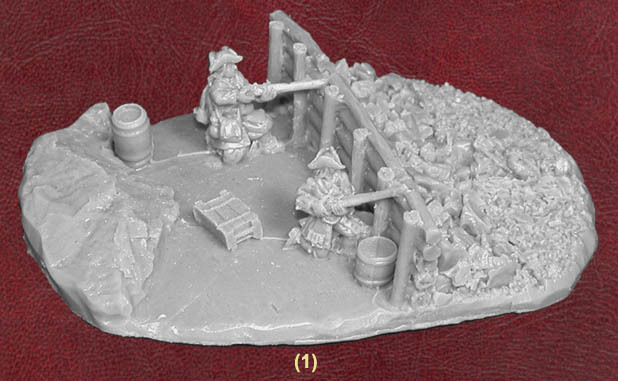 As well as the pictured brown figures this set includes one large diorama piece as shown. This is made in a more resin type of substance, and is much harder and shinier. It depicts an area of barricade or trench, yet despite the complexity of the whole piece it comes in an amazing single piece - figures and all! While we are not big fans of this kind of thing it is actually quite a nice piece and does add to the set as a whole. The set also includes a few paper flags. This is the first of the GerMan WSS sets and for the most part is very nice. GerMan tell us that each figure is intended to represent one of the regular regiments that defended Barcelona, which explains the multi-coloured figures on the box, although the differences are for the most part so slight as to allow all to be used as one unit id preferred. Apart from the clubbing man the figures are appealing and entirely historically accurate, while there is no flash anywhere and even the mounted officer sits on his horse very well. GerMan still have to resolve the problems with the material that they use, but if you can live with that then this is a decent introduction to the new range.